Got green beans coming out of your ears? This month at the US Botanic Gardens here in Washington, DC, we brought two new salads using this popular legume. Green beans aren’t just to be tossed in a little butter – these summery salads are sure to zing things up. In a medium bowl, whisk together the mustard, vinegar, salt, and pepper. Gradually add the oil and whisk until well combined; set aside. Bring a large saucepan of water to a boil. Add the green beans and cook until just tender, 6 to 8 minutes. Drain, run under cold water to cool, and set aside until you’re ready to assemble the salad. 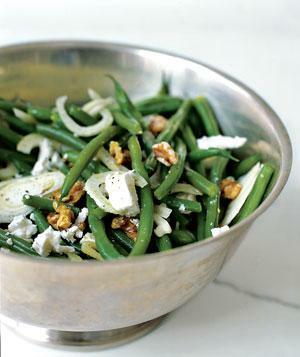 In a large bowl, combine the green beans, fennel, and walnuts. Add the goat cheese, herbs and vinaigrette just before serving (the acidity of the vinegar with turn the green beans to a dull green if marinated). Toss well and serve at room temperature or chilled. Serves 8-10. This entry was posted in Salads, Sides, Vegetarian and tagged beans, fennel, goat cheese, walnuts. Bookmark the permalink.